The scleral ossicles (ossiculae sclerae) in the scleral plate overlap each other laterally such that segments of two ossicles are frequently seen in cross sections of the scleral plate. The anterior part of the sclera is covered by the conjunctiva, which consists of a columnar epithelium and a sub epithelial connective tissue layer. 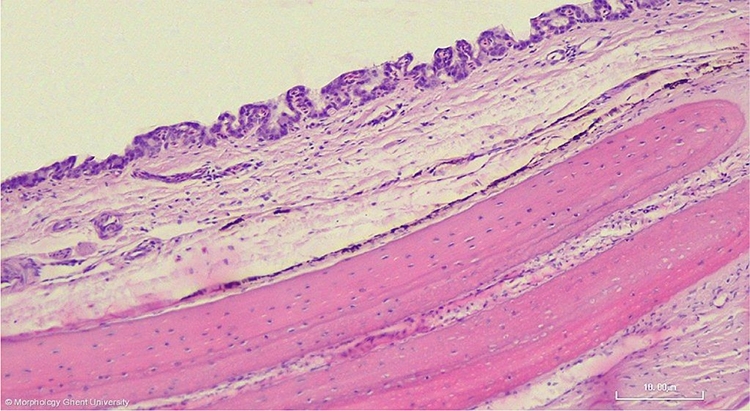 The development of the scleral ossicles is induced by the conjunctival papillae, epithelial thickenings of the conjunctiva that are present only in embryonic stage. These conjunctival papillae induce cellular condensation in the underlying mesenchyme in which the scleral ossicles develop.